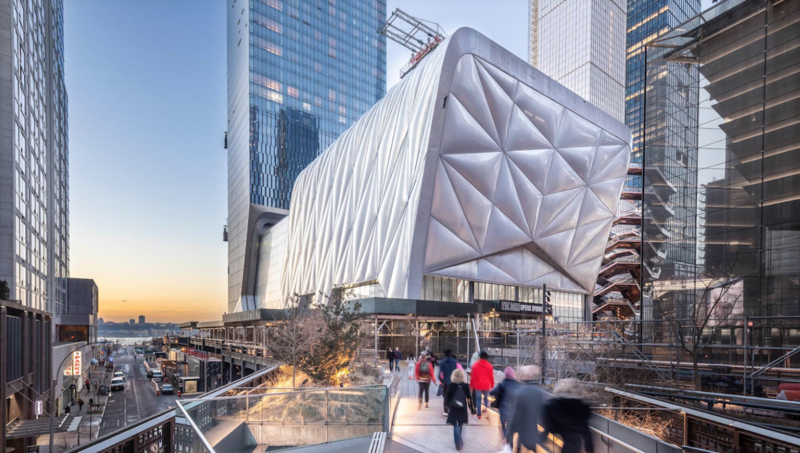 The Shed’s Bloomberg Building, designed by Diller Scofidio + Renfro, Lead Architect, and Rockwell Group, Collaborating Architect, is an innovative 200,000-square-foot structure that physically transforms to support artists’ most ambitious ideas. Artists like Gerhard Richter, Trisha Donnelly and Steve McQueen will show commissions at the US$475 million arts center in the Hudson Yards neighborhood. For its inaugural season, the 200,000-square-foot arts space — designed by the firms Diller Scofidio + Renfro and Rockwell Group — has commissioned more than a dozen exhibitions, performances and lectures. The lineup features both well-established and emerging artists from the worlds of performance and visual arts — offering a varied interdisciplinary programming. “We wanted this to be a building that could bring parity across pretty much all art forms,” said Alex Poots, the Shed’s artistic director and chief executive, in a statement. For The Shed’s opening day on April 5, filmmaker Steve McQueen will debut his series Soundtrack of America. The project consists of five evening performances by emerging African-American musicians, exploring the roots of the art form. Starting April 6, the centre will also display three commissioned artworks: the installation “Reich Richter Pärt” with art by Gerhard Richter and music by Steve Reich and Arvo Part; Anne Carson’s performance piece “Norma Jeane Baker of Troye,” starring Ben Wishaw and Renée Fleming; and a film by conceptual artist Trisha Donnelly. Other much-awaited pieces featured in The Shed’s programming include Bjork’s theatrical concert “Cornucopia;” the documentary Cinta Amarilla (Yellow Tape) about the artist Beatriz Gonzalez’s “Auras Anonimas” installation; and the kung fu musical Dragon Spring Phoenix Rise — featuring remixed songs by Sia.